Yesterday I told a group of students that I preside well – the exact phrase was, I think, ‘I celebrate beautifully’. Last week I told a clergy chapter meeting that I find it very hard to remember names. Both statements elicited the same response – that saying either of these things is inappropriate. Some things can be learnt – how to preside – others are innate gifts (or lack thereof). I can understand why some one might think I was boasting in the first statement (although I ascribed my ability to presiding well to those who have taught me), but I don’t understand why admitting something I can’t do isn’t helpful. We seem to be hung up about success AND failure in the church, and in ‘polite’ religious society, neither should be admitted publicly. The resultant fall-out from this generates people who in any other walk of life would be incapable of doing their jobs well. If you know that you can do ‘x’ but you struggle with ‘y’, while your colleague aces ‘y’ but isn’t too hot at ‘b’, then when you next appoint to the team you look for someone who is strong on ‘b’, and might add a bit of ‘a’ to the mix too. A bit like accepting parts of the body of Christ who function well in as completely different body parts to your own. How we de-skill one another if we fail to acknowledge how we have been gifted – or not – in our service of the Kingdom. Exactly so! That was one of the first lessons in leadership and team building in my former life. Know what you aren’t good at, work to improve it, but make sure there’s someone in the team who is good at that and will “cover” you. Do lots of what you do well. I know only too well the problem of not remembering names! I know the faces and can smile at them, but don’t ask me for a name! Well said, Dana. Those who cannot self-appraise properly cannot be appraised. Those who cannot be appraised make collaboration very difficult to achieve. Without appraisal, how can shared ministry grow? I empathize … wish the days had gone when clergy were expected to be able to do all things without making any mistakes … and to do all things as well as the fond remembered priests of sixty years ago did them! Oh … and not to take the blame for a church which, in the 1950s had 600+ members and now struggles to have 60 … it is all the present incumbent’s responsibility! I wonder if people’s reluctance over your statement you preside beautifully also keys into people’s underlying concern regarding performance and a percieved incompatability with worship. There is a tendancy to downplay the importance of making our worship beautiful and a movement towards a functionality in worship without any real agreement or though as to what function worship is actually has. 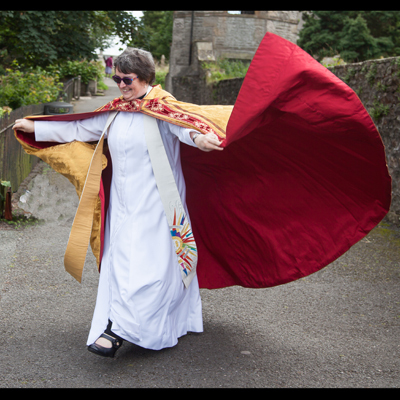 We had a gorgeous curate called Rosemary (Mark, I can’t remember Rosemary’s surname, can you oblige) whom Mark Wroe our vicar then, advised was excellent at never being embarrassed at asking our names repeatedly. He wasn’t as good at this; like most people. This knowledge has assisted me enormously in life overcoming a great deal of embarrassment as I have never remembered faces or names, indeed wondering who the lady was who turned up at school when I was six. My mother had had her hair cut.